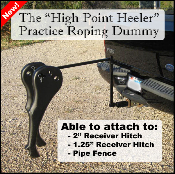 The “High Point Heeler” is built to last and provides excellent practice for every level of heeler. This dummy can easily be taken with you to any competition and sets up in minutes. Practice with yours as you compete to become the High Point Heeler!